I do not buy frozen french fries or tator tots very often. Now, that we are trying to stay away from packaged and processed foods, I doubt I will buying them at all. I have been making a lot of home made oven fries though. 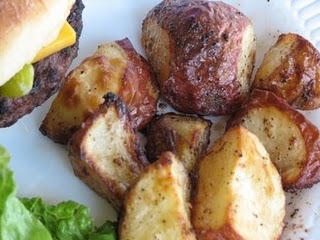 When I made oven fries or potatoes I would cut the potatoes up into small cubes and toss them with oil and seasonings. When we were visiting OR in July I had dinner at a friend’s house. She served us homemade oven fries. They were really good, much better than mine. I asked her what she had done. She told me that she used butter. Butter, I had never thought of that. All this time I had been using oil. So, when I got back home I tried melted butter instead of oil. They were so much better. They were crispier than my normal oven fries or potatoes. So, thanks Steph for the great tip. There are several different things that I like to season my oven potatoes with. I think my favorite though is Emeril’s seasoning. You can buy it, but there is also a variation that you can make at home. Thanks for the butter tip. I’ve always used oil too. I’ll try the butter! I am definitely going to try butter. Oven fries are so delicious. Going to mix up some of this bam-bam seasoning. Good tip, using butter. Also, love the BAM seasoning. I will have to make some of this to keep around. Ditto. I’ll try butter next time. Good tip! We use sweet potatoes a lot – like this or whipped or baked in the skins. Kids love them! I love homemade oven potatoes! Thank you for sharing the seasoning recipe too! I always use Olive oil… I can’t wait to try butter! Sounds like a great recipe. Will have to try. Thanks for shraing. My hubby likes butter. I’ll have to try this. at what tempt and for how long? im kind of new to baking things and this looks delicious! Faye, for oven potatoes I usually cook at 400 or 425 and the time depends on how big you cut your potoates and how crispy you like them. Smaller ones will take 30-40 minutes and larger potatoes usually 40-50. Just check them a few times to check doneness. I hope that helps. Thanks! yours looked so good! 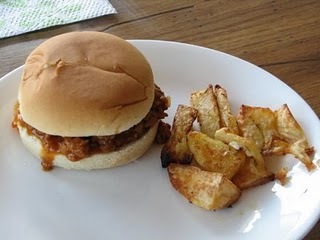 i made this the other night for dinner, it was so delicious! I made mine with Smart Balance butter (no hydrogenated oils etc) and the smart balance with olive oil. yum yum yummy! i was going to post a pic but they didnt last long enough to take one!!! thanks for sharing such a simple yet scrumptious tip!! !